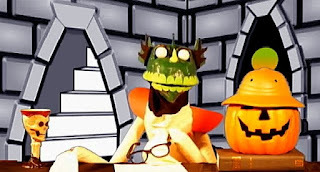 The World of the Weird Monster Show has had a new ending credits theme song recorded by Dan Ingala. 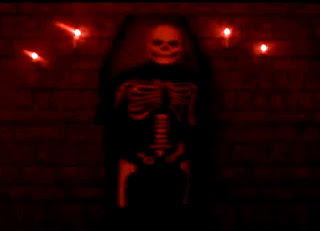 E. Spanto presents the full film of The Children in the February 2012 edition of Bloodshot Theatre Horror Showcase. 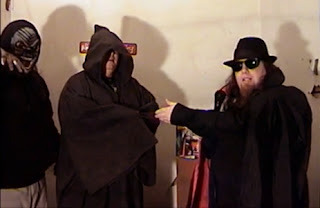 In an episode of Madd Frank Presents from the 1990's, Madd Frank hosted the movie The Crawling Hand. 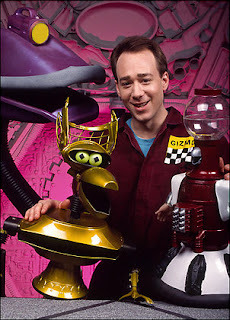 In episode 108 from the first season of Mystery Science Theater 3000, Joel Hodgson and the bots are forced to watch an episode of Radar Men From the Moon and the movie T­h­e S­­lim­­e P­eo­p­le. It originally aired on January 9, 1990. 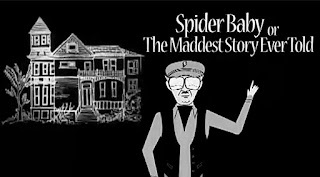 The first episode of the second season of Nite Owl Theatre features Fritz the Nite Owl presenting the movie Spider Baby along with classic commercials and his film facts. 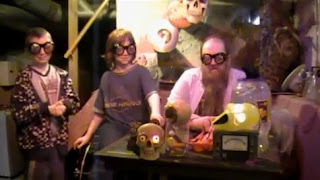 Episode 38 of The Basement Of Baron Morbid has Devin joining Baron Morbid and Jacque as they present the movie The Legend of Boggy Creek. 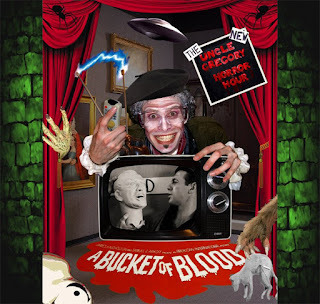 Uncle Gregory decides to become and artist when he presents the movie A Bucket of Blood in episode four of The New Uncle Gregory Horror Hour. 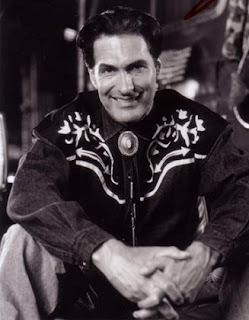 In episode 52 of the first season of MonsterVision, Joe Bob Briggs presented the movie Howling III: The Marsupials. Monster Movie Night - Death or Consequences? 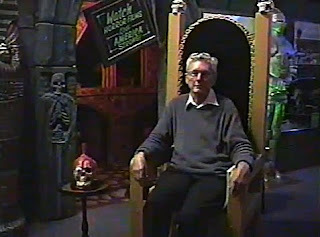 Bobby Gammonster, the host of Monster Movie Night, is the presenter on a horror host game show called Death or Consequences?. The first edition of it features Dr. Mel Praxis, Dr. Sigmund Zoid, Sally the Zombie Cheerleader, Dr. Lady, Baron Mardi, Woody, Basement Boy, and Dr. Calamari. 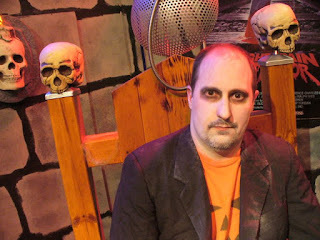 Monster Creature Feature host Ormon Grimsby stage his annual Halloween event on October 28, 2011. 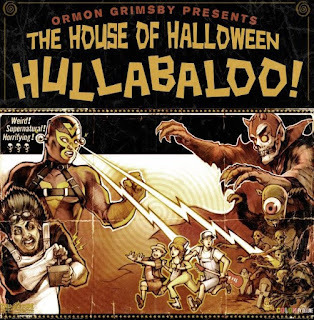 This one, called Ormon Grimsby Presents The House of Halloween Hullabaloo, featured the bands The Straight 8s, The Tremors, and The Wiley Fosters. 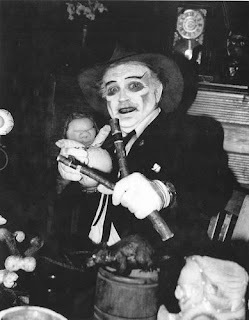 Ormon even appeared with Southern Culture on the Skids in 3D clips in between the acts. Mr. Lobo lets Creature Features host, John Stanley, take over an episode of Cinema Insomnia to present the movie he produced, Nightmare in Blood. 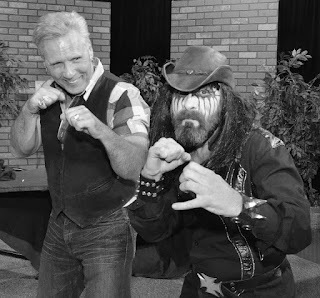 In the 8th episode of Ask Ormsby, Ormsby responds to a letter asking for some dating advice. 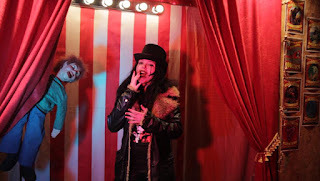 On Valentine's Day, Chuck DeClown find the vampire girl of his dreams in a special Center Ring Cinema entitled Love Bites. 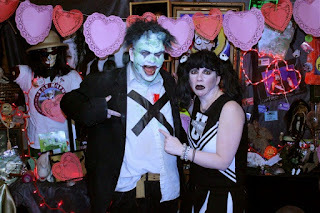 Slo Frank joins Sally the Zombie Cheerleader to help her figure out what Valentine's Day is about and present Be Big!, a Laurel and Hardy short, in The Zombie Cheerleader Show 2012 Valentine's Day Special. On Valentine's Day, Mr. Potent tries to win Roxsy Tyler's heart with supernatural help, which makes trouble for Johnnie 13 and the rest of the workers at Roxsy Tyler's Carnival of Horrors, as they try to fix things and present the movie White Zombie. In an episode of the 1970s Los Angeles, California based Fright Night, Grimsley teased his audience with a promise of a 3D movie. Uncle Gregory gets obsessed with the movie Horror Express, which he presents in the third episode of The New Uncle Gregory Horror Hour. 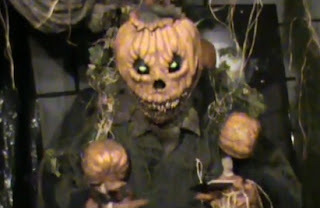 In an episode from the second season of Fright Night Theater, The Pumpkin Man stages a dating game show while he presents the movie Teenagers from Outer Space. 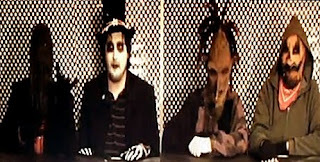 In a segment of Dr. Destruction's Crimson Theatre, Dr. Destruction, interviews the son of Dr. Cadaverino and shows clips of Tolouse NoNeck and Dr. Cadaverino. 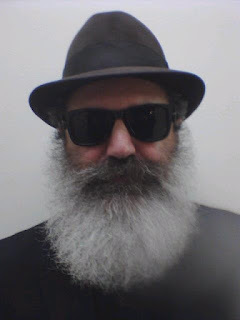 On February 6, 2012, Karlos Borloff was an in-studio guest on the California talk show The Ask Dino Show. 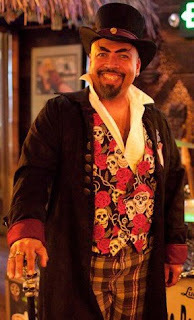 The show's host, Dino Maddalone, got Borloff to discuss the past, present, and future of Monster Madhouse. In the sixth episode of the third season of The World of the Weird Monster Show, Undead Johnny and Dementia deal with three new interns at Channel 666 as they present the movie Deep Red. 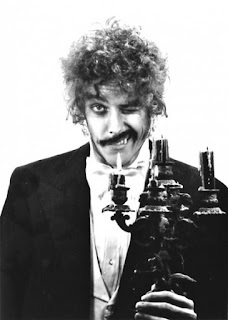 The fifth episode of Sinema Sinistre has Lord Blood-Rah returning to guest host a presentation of the movie Carnival Of Souls. 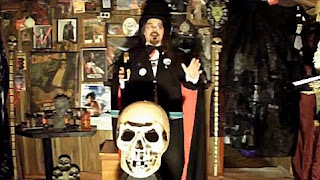 In the 2012 debut episode of the Indiana based Scarevania's Freak House Flicks, Francis D. Pickles, Nibbles the Clown, and Punkin are joined by Jasper T. Colbaire to present the movie The Tingler. 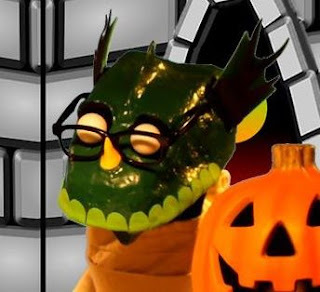 When Bobby Gammonster hosts the movie I Bury The Living in the season 2 episode 7 of Monster Movie Night, he is also presenter of the game show Death or Consequences with Dr. Sigmund Zoid, Dr. Mel Praxis, as Doctor Xombie contestants. 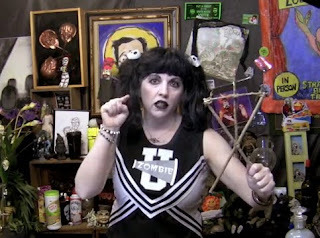 Sally the Zombie Cheerleader tries to figure out what Groundhog Day is about by watching the movie The Legend of Boggy Creek and getting some help from her horror host friends. Who is Dr. Mortose? 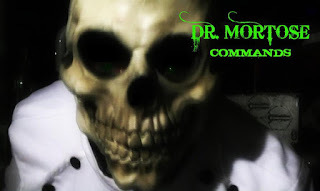 is a short film explaining the origin of Dr. Mortose, from Dr. Mortose Commands.